After the drywall is roughed in to the house, the seams and screws are mudded This process involves running joint compound, putty-like substance in-between all of the seams and over the blemishes and screw heads. The joints have a paper tape placed over them for added rigidity and additional joint compound smoothed over it. Corners use a light-weight and thin metal that is bonded with the compound as well. Hundreds of pounds of joint compound as well as thousands of pounds of drywall board are used in the construction of a home. Drywall is a construction material generally used to make the walls and ceilings flat making it easier to receive paint. It is a flat gypsum board covered by paper. Drywall is commonly called sheetrock, plaster board, or wall board. If you want to know how much drywall should cost, you must first understand that the cost will vary depending on many things. Although prices of drywall are normally computed per square foot, you also have to consider other materials like nails, screws, paint, tape, etc. If you are considering having a certain part of your house renovated, you should ask "how much should drywall cost for replacement?" Otherwise, if you are just wondering "how much should drywall cost for repair?" then the amount will be minimal. The first thing that you are going to do is measure the area of the room, meaning the height and width. A standard drywall sheet measures 4' x 8'. When you already know the area, you can derive the number of drywall sheets with the corresponding size by dividing the area of the room with the size of the drywall sheets. For the ceiling, you will repeat the same process of measuring the length and width of that area. Normally, you put drywall screws a foot apart to keep the drywall sheet in place, so it would be more or less 45 screws. It is best that you compute it on an overall basis so you would get the total amount and you may get them at a bulk price. Lastly, you will need to take into account the quantity of drywall compound. This is necessary to keep the drywall flat and hide the point of connection between drywall sheets. Generally, you need at least 5 gallons for every (10) 8' pieces of sheetrock. If you are just repairing a portion of the drywall like a small hole, a patch kit is what you need. If you want to have your own equipment, in case you will need them later, you can try looking at your local hardware or do-it-yourself stores for a drywall repair kit. Amazon.com sells them for $11 to $16 and may include a putty knife, drywall tapes and screws, sandpaper and a mud pan. The price variation of patch kits is actually due to the size of the patch and the durability of the material. 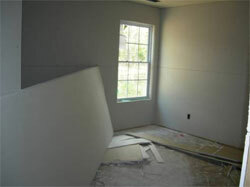 If you are going to repair a very small portion of the drywall, you may opt for a cheaper patch. Some holes that are really small only need joint compound to repair it. A five gallon bucket of joint compound normally costs $13 to $16 dollars. A replacement cost is much more expansive not only because you have to purchase drywall but also because you need to buy a lot of other materials. An average cost of drywall sheets including the required screw, tape and joint compounds ranges from 25 to 30 cents per square foot for the material alone. There is also a delivery charge if you cannot pick up the sheetrock yourself. Depending on the area you are about to re-install the drywall to, the exact measurement will vary. You have to consider irregular floor plans and designs. If you intend to hire the help of professional installers, they normally charge $1.00 per square foot. This price should include all materials and when the contractor is done all you should have left to do is paint. The average price to pay a drywall sub-contractor to sheetrock is 20 cents a foot. The taper should get 25 cents a foot. You can bring down the total cost of installation about 40-50 percent if you do the installation yourself. However, installing drywall is not as easy as patching it. Unless you have a previous experience in installing drywall, wastage possibilities are fairly high. Another thought to consider when doing the installation yourself is the need for assistance. Drywall sheets are heavy; if you are going to install it on the ceiling you need someone else to help you with it. If you are replacing a small portion of the house, doing it yourself may be acceptable. However, if you need to tear down existing walls or remove an entire ceiling and replace it with drywall, it is best to get help to ensure the best results.